Cleaning a house is one of those boring and time consuming activities that most people don’t look up to. On the flip side, a clean house is not only welcoming but also comfortable and luxurious to stay in. In addition to that it promotes good health and hygiene to the occupants of the house. Good hygiene is important especially in a home with young kids who will literally touch anything and end up putting their hands in the mouth. As a bonus, a clean home keeps away insects, germs and pests that thrive well in dirty places for example cockroaches. Presented in this articles are tips to help you enjoy cleaning your home easily even with limited time. 1.Install air purification and purification systems. These are great resources in keeping the atmosphere of your home clean. They allow fresh air into the house while reducing dust, molds, pollen and pet fur that cause health issues. 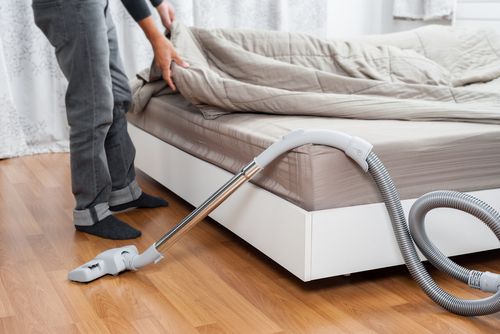 It is vital to vacuum the carpets and other soft space and dust surfaces regularly for a dust free home. Ensure regular inspection and replacement of filters as recommended. This tip comes in handy especially if there are people allergic and asthmatic. Shoes are the major culprits that drag a lot of dirt from outside which ends up the floor. 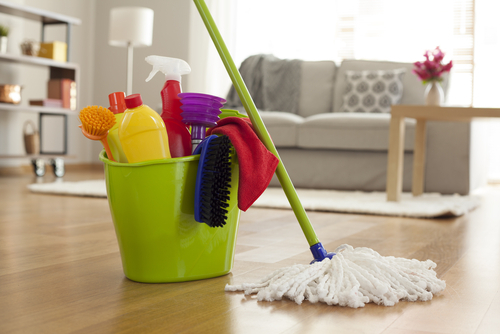 Before getting down to clean the floors, it is a good idea to minimize the dirt that is dragged inside first. A good door mat with an anti-slip back will help to trap dirt and clean the shoe soles before one walks in. Ensure the door mat is large enough for both feet to be cleaned through. For the best service, clean the door mats regularly. For families with members who are allergic to dust and other air-borne particles, this tip can save you trips to the doctor. When doors are open a lot of dust gets into the house, though it goes by unnoticed until if forms layers. Minimizing how often you open your doors will considerably reduce the amount of dust getting into your house. Instead of open the doors for lighting rooms, use the windows. Use window blinds to trap dust and be sure to wash them regularly. Music is popular for its ability to lift spirits. Whenever you are feeling like you cannot clean, just select your favorite album and get it playing. As you will be singing along you will be cleaning subconsciously. You will be surprised how the work gets done while enjoying the process. For the cleaning process to be successful and maintained, the involvement of all family members is vital. Every member should be aware of the benefits of cleaning and if not it will be needless to clean only for it to be messed up almost immediately. There are a variety of ways to involve your family which include setting schedules when everyone is available and doing it together. If that is not possible, then assigning personal duties might be easier. On top of that, each member should be responsible for instance kids can be taught to pick up their toys off the floor after playing. Therefore, involving everyone simplifies the whole task while making it enjoyable. A house with confused, disorganized jumble of things is definitely not appealing. This is a common phenomenon in many houses as people end up with stuff they don’t use. De-cluttering can be very challenging and overwhelming, but once accomplished it is worth the trouble. The toughest part is deciding whether to keep an item or to toss it, but at the end of the day you got to decide and stick to the choice. Freeing up more space will make the house appealing to you and to the guests. The kitchen is a special place that needs attention and special cleaning since this is where food is prepared. No one wants food that has been cooked in a messy kitchen! It kills the appetite. Therefore, it needs thorough daily cleaning. Use an anti-fungal and anti-microbial cleaner combined with baking soda to kill germs and remove stains. The floors should be mopped thoroughly and dried paying special attention to place near cookers where food is likely to spill. Fridges and other kitchen appliances are usually forgotten ensure you set a day a week to clean them inside out. Most importantly, empty the trash daily for a more hygienic kitchen. Pets love to play outside and if not closely monitored, they can bring a lot of dirt into the house making it unhygienic. To control this, place a rug by the door step so that the pets can wipe their paws before getting in. keep the door closed to be able to check them in. Eliminate the chances of loose fur falling out in the house by brushing them outside at least once per week. For the little fur that gets stuck on the sofa, wipe with a dump cloth while using a vacuum cleaner to pull out hair from rugs and carpets. It is not a fun place to clean but a shiny, sparkling toilet is an attraction to many. White vinegar is a great cleaner when it comes to the toilet. It is all natural, kills bacteria, germs, molds and removers scum. As a bonus, it gives your toilet an all sparkling clean finish. To clean, pour it on top of the toilet while spraying around the seat and cleaning. Scrub the bowl with a toilet brush meanwhile stuffing a vinegar soaked paper towel under the rims. Remove the paper towel and scrub under the rim. Now you can flash and voila! You have a clean sparkling toilet. This are some of the tips that will help you make cleaning easier for you and your family. While a clean house is appealing to both you and your guests, it goes further to provide a hygienic, germ free environment for a health family. Bottom line, the benefits of a clean home out do the boring part of cleaning. Avoid procrastinating and enjoy a clean home.